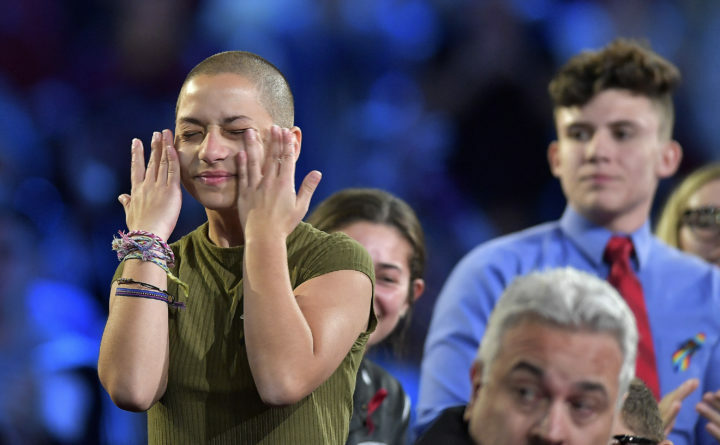 Marjory Stoneman Douglas High School student Emma Gonzalez wipes away tears during a CNN town hall meeting, Wednesday, Feb. 21, 2018. Former Maine State House candidate Leslie GIbson came under fire for calling Gonzales on Twitter a "skinhead lesbian" and another student a "bald-faced liar." Republican Leslie Gibson has announced that he is dropping out of the race for Maine House District 57, representing Greene and Sabattus. Gibson came under fire for his Twitter remarks about two students who survived the Feb. 14 shooting at Marjory Stoneman Douglas High School in Parkland, Florida. He wrote that one of the Parkland students was a “skinhead lesbian,” the other a “bald-faced liar.” Gibson later apologized to one of the students. Gilchrist and Martin both cited Gibson’s remarks as motivation for running. Gilbert reportedly said he rushed to take out papers because of Gibson, but might step aside, given that Gilchrist had filed. On Friday, Gibson was still listed as an active candidate on the Maine Ethics Commission’s website but his name had been removed from the secretary of state’s list of active candidates. Correction: A previous version of this report listed the wrong town of residence for Thomas Martin.